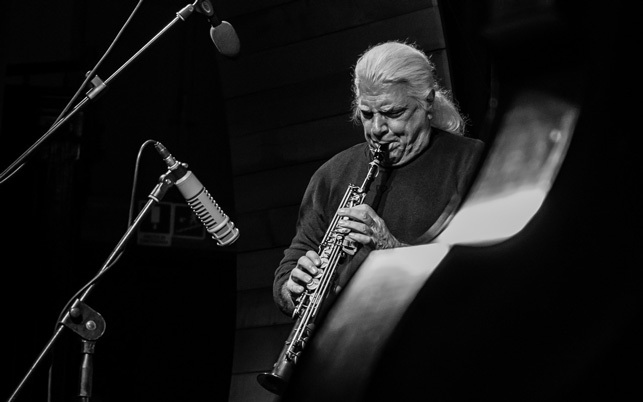 As a composer, Vinny Golia fuses the rich heritage of Jazz, contemporary classical and world music into his own unique compositions. Also a bandleader, Golia has presented his music to concert audiences in Europe, Canada, Mexico, Japan, Australia, New Zealand and the United States in ensembles varying dramatically in size and instrumentation. Golia has won numerous awards as a composer, including grants from The National Endowment of the Arts, The Lila Wallace Commissioning Program, The California Arts Council, Meet the Composer,Clausen Foundation of the Arts, Funds for U.S. Artists and the American Composers Forum. In 1982 he created the on-going 50 piece Vinny Golia Large Ensemble to perform his compositions for chamber orchestra and jazz ensembles. A multi-woodwind performer, Vinny's recordings have been consistently picked by critics and readers of music journals for their yearly "ten best" lists. In 1990 he was the winner of the Jazz Times TDWR award for Bass Saxophone. In 1998 he ranked 1st in the Cadence Magazine Writers & Readers Poll and has continually placed in the Downbeat Critic's Poll for Baritone & Soprano Saxophone. In 1999 Vinny won the LA Weekly’s Award for "Best Jazz Musician". Jazziz Magazine has also named him as one of the 100 people who have influenced the course of Jazz in our Century. In 2006 The Jazz Journalists Association honored him with a Lifetime Achievement Award. 2013 Vinny won the Downbeat Critic's Poll in the "New Star" category for Baritone Saxophone. Golia has also contributed original compositions and scores to Ballet and Modern Dance works, video, theatrical productions, and film. As an educator Vinny has lectured on music & painting composition, improvisation, Jazz History, The History of Music in Film, CD & record manufacturing and self-production throughout the United States, Europe and Canada. He currently teaches at California Institute of the Arts. In 1998 Golia was appointed Regent's Lecturer at the University of California at San Diego. From 2009 to 2012 Vinny was the first recipient of the Michael Colombier Performer/Composer Chair at the California Institute of the Arts. Vinny has been a featured performer with Anthony Braxton, Henry Grimes, John Carter, Bobby Bradford, Joelle Leandre, Leo Smith, Horace Tapscott, John Zorn, Tim Berne, Bertram Turetzky, George Lewis, Barre > Phillips, The Rova Saxophone Quartet, Patti Smith, Harry "the Hipster" Gibson, Eugene Chadburne, Kevin Ayers, Peter Kowald, John Bergamo, George Gruntz Concert Jazz Band, Misha Mengelberg, Han Bennick, Lydia Lunch, Harry Sparrney and the Los Angeles Philharmonic Orchestra amongst many others.